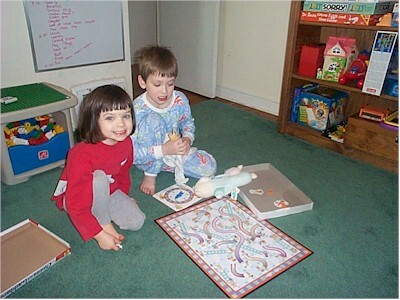 Buddy beat me badly in our first game of Chutes and Ladders on Friday night. In the second game, I landed on the 99th square and he slid down a chute to the second row from the bottom. Since I needed to spin a "1" to win the game, he still had a chance. Seems I just could not get the arrow to land on the "1" and Buddy kept on climbing. Eventually, we were both sitting on the 99th square. After three or four spins for each of us, Buddy spun a "1" and won the game!